Taglines: Dream a whole lot louder. Jeremy Jordan's first movie and starring role. Continuity: During the choir's "Man in the Mirror" number, Dolly Parton mouths a wrong word. 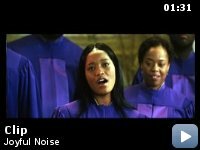 "Joyful Noise" is a harmless, well-intentioned movie that was clearly made with no goal in mind apart from being uplifting. It's easy to see why the critical response has been largely negative; in its innocence, it leaves many questions unanswered, whitewashes a number of harsh realities, and repeatedly sidesteps plausibility for the sake of entertainment. While I cannot argue with these observations, and while the film is ultimately too flawed and predictable for me to recommend it, I'm not inclined to be ruthless. Writer/director Todd Graff has his heart in the right place. And because the subject is a gospel choir, he treats us to a number of well-arranged musical interludes that showcase some real talent. Regardless of whether the songs are Christian, pop, or country, passion pours off of the screen each and every time. The plot, while paper-thin, is easily understood and admirable in its efforts to be inspiring. Taking place in a small Georgia town hard hit by the economy, it begins with the sudden death of Bernard Sparrow (Kris Kristofferson), the choir director for the local church. Chosen as his replacement is choir member and second in command Vi Rose Hill (Queen Latifah), who makes ends meet as a registered nurse. Bernard's widow, G.G. (Dolly Parton), who's well off and one of the church's major benefactors, believes she should have been chosen as the next choir director, as she too is a member and believes it's what her husband would have wanted. She's not the bitter type, so if you're thinking she becomes evil and vindictive, you've got another thing coming. Because times are tough, and because the choir has consistently lost in the national Joyful Noise gospel competition, the program is under constant threat of being cut. If they can finally win this year, it would give the people of their small community something to believe in. The stern Pastor Dale (Courtney B. Vance) wants their music selection to reflect the traditional gospel style. So too does Vi. G.G., on the other hand, has come to believe that a more contemporary sound will give them an edge. This puts both women at odds with one another, which isn't all that shocking since they were never the best of friends to begin with. There are many reasons for this, although it seems a combination of class division and their own egos are the major contributing factors. The film never wastes an opportunity to show how headstrong they both are; Vi is a hardworking single mom resistant to change, whilst G.G. can't go five minutes without dispensing an obscure Southern proverb. There's another, more character-driven side to the story, although that doesn't prevent it from being just as conventional and easy to see through. Vi is the mother of two teenagers. Her son, Walter (Dexter Darden), has Asperger's syndrome, a trait that's likely to divide audiences as it's debatable how seriously Graff takes it. He provides Walter with reliably odd personality quirks, such as constantly wearing sunglasses, spontaneous singing, a repulsion to being touched, an inability to tell whether or not someone is joking, and a superfluous mental database of one-hit wonders (none of which, he informs us, can be found in gospel music). He also makes Walter keenly aware of his personality defects; at one point, he tearfully admits that he's angry at God for making him the way he is. Her daughter is sixteen-year-old Olivia (Keke Palmer), who's at just the right age to start acting out. She doesn't sleep around or become an addict. She does, however, begin hanging around with G.G. 's rebellious and outgoing teenage grandson, Randy (Jeremy Jordan), who has returned to Georgia from New York after his mother kicked him out. While his past is never revealed to the audience, it seems he has a reputation for being a bad kid. Vi disapproves of him, which will inevitably create friction between her and Olivia. Our instincts have already told us that he's not bad, but has merely had a tougher time of it than others and is at heart decent. He will join the choir and, with his amazing singing voice, prove himself instrumental in pushing for a new sound that will hopefully win them the upcoming competition in Los Angeles. I mentioned earlier that I wasn't inclined to be ruthless. I'm still not inclined, although I do feel it necessary to point out a few of the more overt missteps in "Joyful Noise." It's established that Olivia's father (Jesse L. Martin) is a military man who was forced to rejoin the army after losing his job. While Olivia is willing to see past this, Vi clings to the misguided belief that he knowingly abandoned her. I would wager that, if he stayed in town as an unemployed man, she would resent him even more. In addition, we have a small subplot involving two choir members who fall for each other; apart from the fact that both are one-note typecasts, their story is so unfunny and badly strung together that it actually ruins part of the final scene, which had the potential to be very sweet. Finally, we have a painfully contrived scene in which Vi and G.G. get into a slapstick catfight at a restaurant. If there's one thing a movie like this doesn't need, it's two grown women acting like children.